From L-R: Dr. Kubby Layeni-Adeyemo, Director Occupational Health and Staff Health Services, Lagos State Ministry of Health; Dr. Olufemi Onanuga, the Special Adviser to the Lagos State Governor on Primary Health Care, and Mr. James Marsh, the CEO James Marsh and Associates, at a Sensitisation meeting on Hazard Analysis and Critical Control Points (HACCP) with Stakeholders in the Water, Food and Beverages Industry at Alausa, Ikeja, Lagos recently. The Lagos State Government has moved to check food and water contamination in eateries, restaurants and hotels across the state, charging stakeholders to embrace the Hazard Analysis Critical Control Point (HACCP) and certification. HACCP is a management system that gives a systematic preventive approach to food safety, from biological, chemical, and physical hazards from raw material production, procurement and handling, to manufacturing, distribution and consumption of the finished product, through identifying where hazards may occur and design measures to reduce the risks to a safe level by putting in place stringent actions, strictly monitoring and controlling each process. A release from Mrs. Adeola Salako, Director, Public Affairs, said that Dr. Olufemi Onanuga, the Special Adviser to the Governor on Primary Healthcare, lamented that food safety had become a major concern to the food industry given that the consumption of contaminated food and water contributed to myriad of health problems in the world. She said Onanuga spoke at a sensitisation meeting for food, water, beverage handling establishments in Lagos recently. “Food and water prepared, served at the restaurants, eateries, hotels and those processed in factories may look clean and taste delicious, but may have been contaminated by biological, chemical or physical hazards during the preparation procedures from the source through to service,” he said. Onanuga noted that food hazards or contamination might also come from primary production like the farm, from improper handling or storage in the food industry, or from errors during preparation at home or in other places where the food is consumed. The Special Adviser added that kitchens are also viewed as the major sources of contamination stressing that contamination from kitchen could be from poor sourcing and handling practices, which include under-cooking, poor personal hygiene, use of unclean equipment, inappropriate storage and incorrect holding temperatures amongst others. He noted that a tool that gives a holistic approach to food safety for consumption is Hazard Analysis Critical Control Point (HACCP) stressing that there was need for an effective HACCP system to be in place in every food, water, beverage organization that meet food safety requirement and protect the consumer from harm that could result from any form of hazards. “The Ministry of Health adopted HACCP Initiative in the first quarter of 2017 and till date over 106 HACCP Plans have been submitted. The procedures span from submission of HACCP Plan, review of the document, auditing of the establishment to check compliance and issuance of certification. But this figure is rather low comparing to the number of regulated premises in the state,” Onanuga stated. The Special Adviser opined that for a successful HACCP programme to be properly implemented, the management must be committed to a HACCP approach, adding that the commitment by management would indicate an awareness of the benefits and costs of HACCP, which include education and training of employees. He stressed that in addition to enhanced assurance of food safety were better use of resources and timely response to problems. 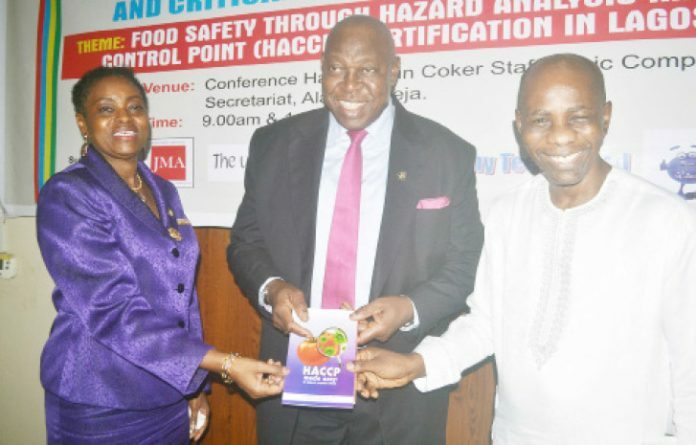 “The benefits of the HACCP Certification to food, water, beverage organisations are many and these include food safety assurance, increased patronage, maintained and improved market access, constant reinforcing of best practices by staff during food handling, prevent enforcement actions stemming from default, ensure continuous improvement and international recognition with trading interests,” he said. 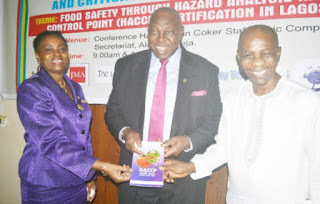 Earlier, Dr. Modele Osunkiyesi, the Permanent Secretary, Ministry of Health, said the essence of the meeting was to sensitise food, water and beverage-based establishment on the importance and having an understanding of the HACCP initiative as well as foster and promote the adoption of the HACCP system in their organisations. She added that the meeting also aimed at emphasising the relationship between good hygiene practices and the HACCP systems as well as gaining management commitment to the promotion of food safety and hygiene. “A proper understanding will prevent sanctions, reduce the form of delays in processing documents and ensure a transparent HACCP Certification by the Ministry. This is not a training but rather to give you the necessary orientation,” Osunkiyesi said. While noting that the HACCP sensitisation meeting would be organised for all zones in the state to reach about 1000 food, water and beverage organisations in February 2018, the Permanent Secretary posited that the implementation of HACCP was the most secure and cost effective method for controlling hazards during food, water and beverage production. “An unsafe product which has harmed someone can result in legal actions by consumers and/or unwanted publicity that adversely affect a broad range of the Company’s products and reputation. Producing and selling an unsafe product may also result in regulatory actions as well as the closure of the business. To avoid such possibilities and to fulfil commitment to public welfare, food manufacturers and handlers must devote significant resources to ensuring the production of safe food products at all levels. “The implementation of HACCP is the most secure and cost effective method for controlling hazards during food/ water/ beverage production. The adoption and implementation of HACCP system require other programmes which are the building blocks that are required for HACCP system such as Good Manufacturing Practices (GMP), Good hygienic Practices (GHP) and Standard Sanitation Operating Procedures (SSOP) and are collectively referred to as Prerequisite Programmes (PRP),” Osunkiyesi added.